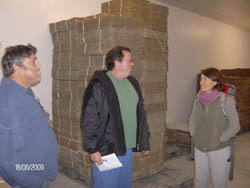 This page chronicles the building a new lobster processing factory after the previous factory was destroyed by fire in February 2008. 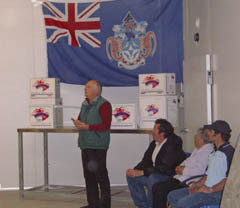 The new factory was opened on 17th July 2009. 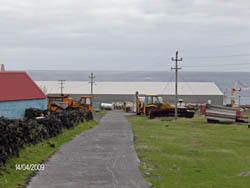 The original fishing factory, situated on Big Beach was totally destroyed by the lava flow from the 1961 volcanic eruption. The modern factory was built on a plateau above the new Calshot Harbour in 1965 and opened in time for for the first fishing day on 23rd May 1966. See pictures and information on the factory in our Background of the Fishing Factory Feature below and also on our Fishing and Fishing News pages for more about Tristan's Fishing Industry. 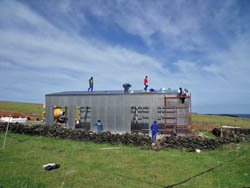 Portal Frame Construction; Aluminium Sheeting; Designed to withstand: a wind speed of 100 knots and seismic activities up to 7.5 on the Richter Scale; Modular design for ease of shipping and erection. 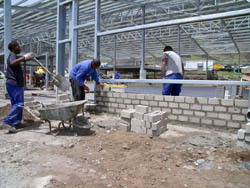 The overall design of the new factory and power plant has been finalised and the general layout is shown in plans which we hope to first publish in the August 2008 newsletter. 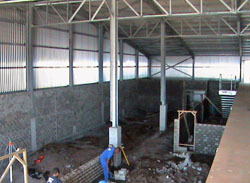 Detailed layout of the factory is a work in progress and Ovenstones are awaiting the return of Manager Erik McKenzie to Cape Town for his final input into the detailed design and layout. 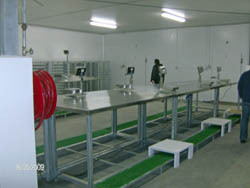 The new factory will be considerably simpler in layout and far more efficient from a processing perspective. The factory is designed to be EU compliant in consultation with the SABS (subject to the Government putting in place the regulatory infrastructure the fish product from the factory should then gain access to EU markets). 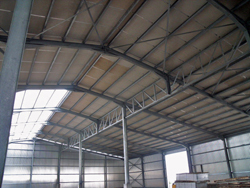 The factory and power plant structures have been designed with Tristan’s environment in mind. They have been designed to withstand wind forces of 100 knots and seismic events up to 7.5 on the Richter Scale. 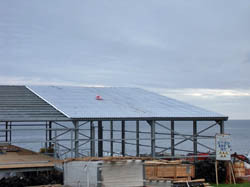 The company have designed very sturdy, fit for the purpose, buildings that will serve the Island and lobster operation for many years to come – well beyond Ovenstone’s current horizon of 2016. 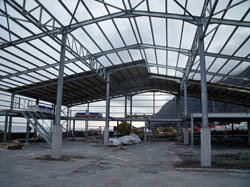 We look forward to being able to utilise the buildings for some time to come! 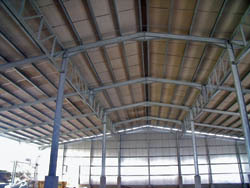 Anchor Steel has been contracted for the design (completed) manufacture (in progress) and erection of the structures. 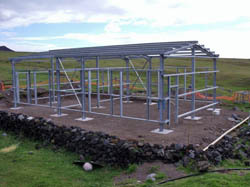 This company specialises in the modular design and construction of steel portal and aluminium clad structures, often in very remote locations with limited infrastructure. 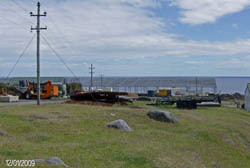 The power plant facility is separated from the factory. Although this is a more expensive option for Ovenstone, they believe it is the right long term choice to make. The plan shows 4 generator units, as this was drawn on the basis of the CTBTO proposal tabled in Cape Town in April 2008. These initial orders have been placed due to repeated and dramatic price increases for these items. For instance steel prices have increased by more than 32 % in 2008. Similarly, due to the electricity generation shortfall in South Africa , generator prices have increased 50 % in the last year. ~ Transport of all plant, equipment and materials to the Island. 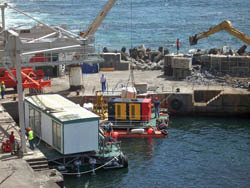 ~ Landing of plant, equipment and materials at the Island without any heavy lift (5 ton plus) facility. These two issues will have a major influence on the rebuilding schedule. The recent run of very poor weather at Tristan has also pushed out the Edinburgh dry dock. This may influence this vessel’s schedule in June and August, although Ovenstones will do what they can to mitigate this. All the above considered, the rebuilding schedule has been pushed out for a spring start in September/October, rather than in July 2008. 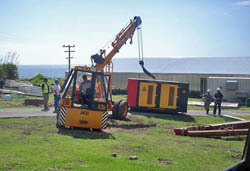 The objective remains to have the factory commissioned and ready for operation for the start of the 2009/10 season on 1 July 2009, but everyone must be made aware that there is a significant risk that this target deadline may not be met due to the logistical challenges caused by the loss of the crane. The Power Plant is planned to be commissioned during the 4 th quarter of 2008, subject, again, to there being a crane facility to lift the heavy items (gen sets) ashore, that are in excess of the company crane lift capacity. The project to design and replace the Government crane is being run in parallel with the Factory rebuilding project. Both Ovenstone and project managers are using their best endeavours to assist the Tristan Government to replace the crane within the envisaged rebuild time frame. 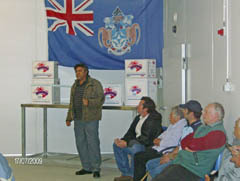 Andrew James from Ovenstones confirmed on 10th October 2008 that the 1800 tonne ship MV Baltic Trader had been secured to provide the essential transport of personnel and cargo for the fishing factory rebuild. See full statement and details of the ship on the Shipping News Page. In addition the ship will bring a new heavy duty crane and may be involved in shipping materials for the next phase of the harbour refurbishment - See the Calshot Harbour News Page. 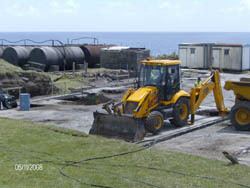 Despite the lengthy search for a suitable vessel, and various other challenges that Ovenstone and The Apple Group have faced, I remain confident that all the civil and engineering work planned for the 2008/09 summer season can be completed on schedule and that we can enjoy a factory opening ceremony when the Governor visits in April 2009. 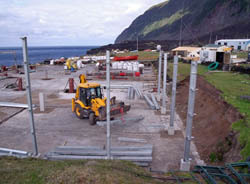 Watch this space for images and news of the rebuilding of the Tristan da Cunha Fishing Factory as it happens. Charl Moolman and his team (Apple Site & Projects, a division & Apple Group) arrived on the Edinburgh on 1st November 2008 and immediately got to work on the foundations of the new Factory. David Morley's picture, left, taken on 6th November, shows work to prepare the foundations ahead of the arrival of MV Baltic Trader with materials, hopefully later in the month. We trust this picture is the first of many as Tristan's third fishing factory rises from the ashes of the fire of 13th February 2008. Charl is going to be taking a regular photos from the same spot, which will show progress most effectively. 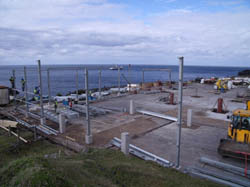 This heartening photograph from Project Manager Charl Moolman taken on 20th December 2008 shows the steel superstructure starting to take shape on the new Generator Room which will be adjacent to the new fishing factory. The arrival of MV Baltic Trader on 19th December heralded the action awaited for months, with steel arriving, together with a new heavy duty barge / raft, a new heavy duty crane and a heavy duty lifting vehicle. 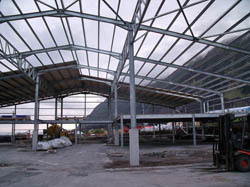 Two views from David Morley to show the rapid progress in the erection of the steel infrastructure of the new fishing factory. 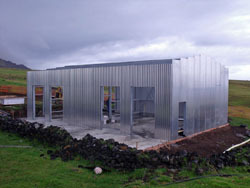 as progress on the new fishing factory switches from the exterior, now largely complete, to interior work. There are 13 personnel from Apple Group working on Factory and 3 from Sea & Shore, working on Harbour. The Leader of Apple Group is Henry van Zyl and the Leader of Sea & Shore is Jorn Dietterle. 10 of the Apple Group are living in temporary accommodation near the Factory Site, 3 are in the Mabel Clark Guest House and the 3 from Sea & Shore are in Corporal William Glass Guest House. Tristan factory employees helped to lay the base but have not been involved since then. If any heavy duty digging is required at the Factory site then two Government drivers are used to operate the JCB and Dumper. 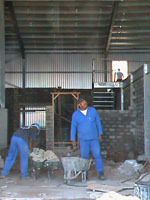 Despite the hard work by the contractors, we are several weeks behind schedule. Due entirely to weather related problems landing materials. 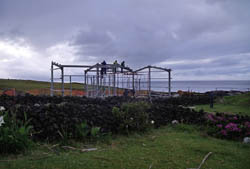 But the factory should be up and running by the end of next month (May 2009), in time for the fishing season. A few details will be unfinished, but at least islanders will have a job to go to. Left : the new view down the road from the Administration Building towards the gleaming new factory. The new power plant is sensibly located a little way west from the factory. Four enormous generators, all electronically linked so they take it in turns to kick in. Their performance will be electronically monitored from Cape Town. Work continues and we are on track to be operating in time for the fishing season, even if some fine points won't be yet in place. Erik Mackenzie, Factory Manager, returns on the MV Edinburgh, due to arrive on Friday 1st May. 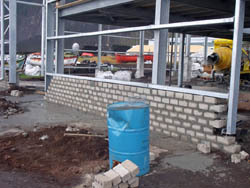 Progress on completing the new fishing factory has continued apace over the last six months. 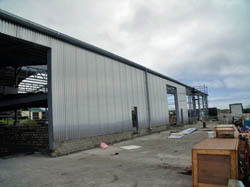 The contractors were under real pressure to complete the factory in time for the beginning of the season on 1 st July and the final fitting out work will continue into July. Production trials were successfully carried out in June, with five power boats fishing the remainder of the 2008/9 quota deliberately held back for this purpose. and Anja Rosler the new facilities. 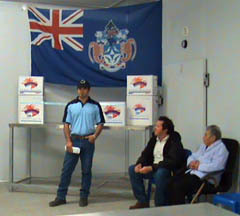 The opening went off quite smoothly in a very relaxed atmosphere. Erik's main point was that we did not merely replace the existing factory as per the insurance claim. We invested heavily over and above the insurance amount in order to have a factory we can confidently use to try and get EU certification to increase our marketing options and be sure of a consistently high standard final product. 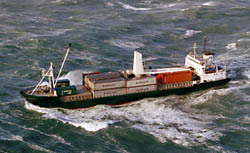 I also gave the news that the Baltic Trader is to be the replacement vessel for the Kelso for the usual 3 annual trips. 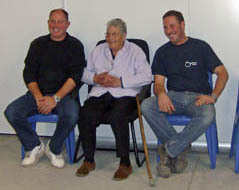 Connie and David both made the point that any doubt which may have existed should now have been removed as to the long term commitment of Ovenstone to the Tristan Community. 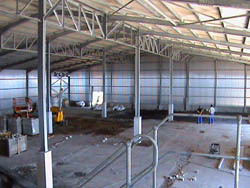 It was also noted that the company had got the ball rolling on a very difficult and challenging project even before the fire was out and that together with Apple had delivered a high quality factory 17 months after the total destruction of the previous one, despite the very big logistical hurdles we all faced. After a reading by Eddie Rogers and a blessing from Archdeacon Michael Weeder, Granny Alice Glass - at 93 the oldest lady on the island - was asked to cut a ribbon to officially open the factory. 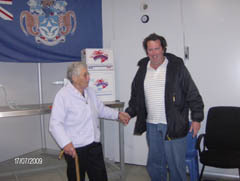 This was because the previous factory was opened by the oldest lady on the island at that time - Jane Lavarello. Erik has found different dates for the previous opening, but will stick with 21 May 1966 as he was born on that day! Ovenstone's Andrew James commented 'throughout the building process I was impressed by the level of cooperation between the various teams and I send my heartfelt congratulations and appreciation to the people on the ground that made this very challenging project a success. 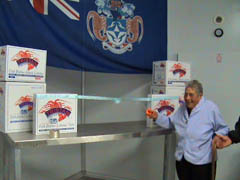 Tristan's oldest resident Islander, 93 year old Alice Glass was invited to open the new factory by cutting a ribbon and officially declare the factory open. 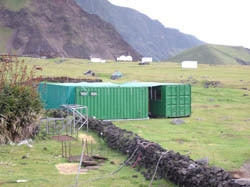 Tristan da Cunha's fishing industry has been the mainstay of a largely self-supporting economy since 1949 when the first canning factory was built on Big Beach. It was totally destroyed during the 1961 volcanic eruption, engulfed by lava which, as well as destroying the buildings also ignited 30,000 gallons of diesel fuel. 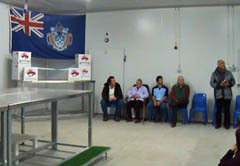 The modern factory is operated by Ovenstones Pty Ltd and provided the hub of the local fishing industry. 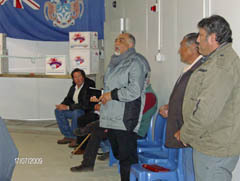 Tristan da Cunha waters are fished entirely by Islanders who go out from Calshot Harbour in the season (July - December or January) in small power boats on fine days. The catch of Crawfish (also known as Crayfish and marketed as Tristan Rock Lobster), is brought back to the Tristan Factory, where is it processed and frozen for export. 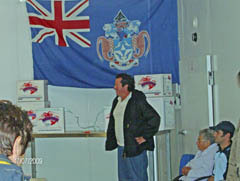 MV Edinburgh also carries out extended fishing trips around the outer islands of Nightingale, Inaccessible and Gough. 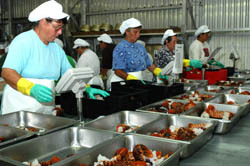 The fishery is expertly managed and a strict quota system has ensured a sustainable harvest. 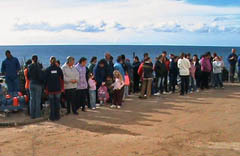 There are a group of permanent factory employees, but this small group is swollen on fishing days by men (and from 2007 one woman apprentice) who are permitted to switch from their Government employment, to work for the factory. 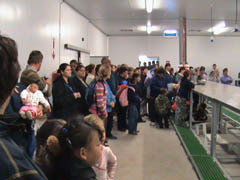 The factory also employs many Islanders who work part-time on fishing days to process the fish. 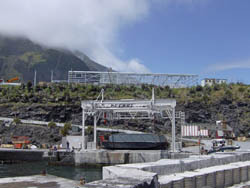 The island community benefits from wages paid to locals, by royalties from the sale of crawfish, from electricity generated by the factory's diesel generators (24/7 in recent years) and by the provision of nine scheduled sailings from Cape Town by the vessels MV Edinburgh and MV Kelso, which gives the island its transport lifeline for people and goods. which is the mainstay of the local economy.